CONDITION:plates good, with marks from handling, movement missing the contact slide that interacts with the the pendulum, dial resilvered, minute hand with minor bends, pendulum good, with evidence of minor oxide on steel components, red velvet faded and fragile, right coil missing two screws, and a bit loose, base with minor scrapes and dings, dome with minor chips and flakes at bottom edge, dome does not sit at bottom of groove due to shrinkage in base, not running. 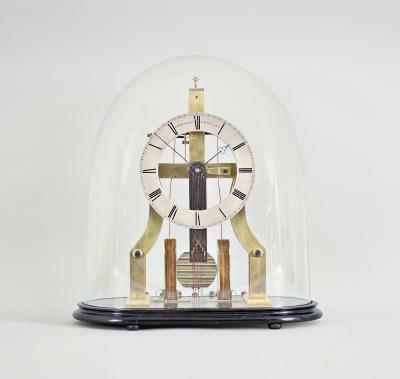 This clock was included in the "Electrifying Time" exhibition at London's Science Museum from 21/15/76 to 4/11/77, and is illustrated on page 43, Plate 2 in the exhibition catalog. 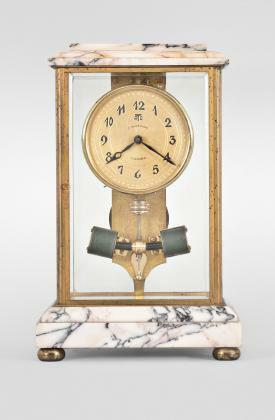 See also "Collectible Clocks" by Alan and Rita Shenton for a color image of this timepiece. CONDITION:case with scrapes, bumps and dings, door above dial with a few short splits, case bottom with old, poor quality repair at right front, door repaired at upper latch, underside of top with glue residue, dial with small spot near center, hands good, dial movements gummy, movement complete, pendulum rod and attachments good, bob may be a replacement, condition of circuitry unknown. See Robert H. A. Miles "Synchronome Masters of Electrical Timekeeping", pages 188 - 191 for a description of this prototype, and photographs of the movement. CONDITION:case with minor bumps and dings, holes in case back for securing case to wall, dial and hands good, tube covering magnetic contact missing, the release armature appears to be a replacement, and the part it presumably replaced is included with the clock, pendulum rod with spots of oxidation, magnet on pendulum rod replaced, but the original U shaped magnet is also included, weight tray replaced, condition of circuitry unknown. See Robert H. A. Miles "Synchronome Masters of Electrical Timekeeping", pages 188 - 191 for a description of this prototype, and photographs of the movement. 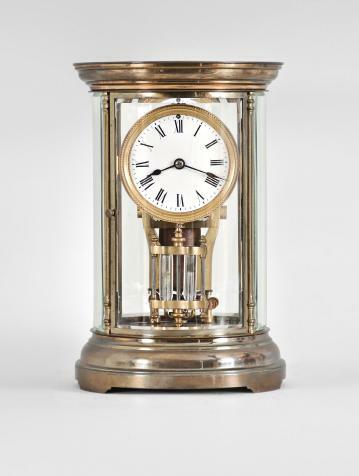 CONDITION:base with minor joint separation at back, front section of base reglued, minor dings and scratches, feet dirty, cast frame very good, movement and other brass components appear to retain their original lacquer, dial with faint hairlines at 2 00, 9 00, hands painted, pendulum bob with minor spotting, the two narrow steel pendulum rods with minor oxide, dome good. Appears to be complete, but operating condition unknown. 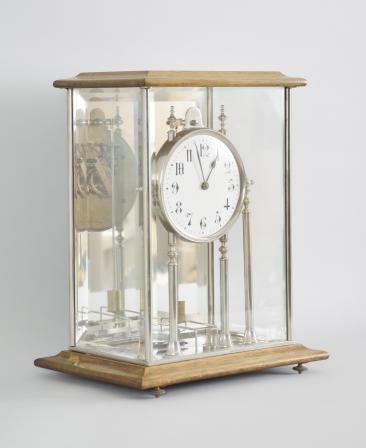 Matthaus Hipp (1813 - 1893) was born in Blaubeuren, and at age 16 he was apprenticed to clockmaker Johan Eichelhofer. 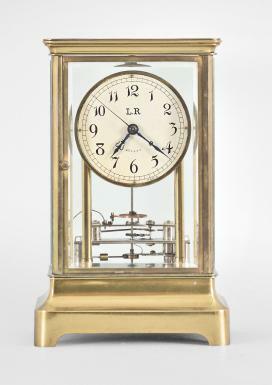 He was a pioneer in the field of electrical timekeeping, and was regarded by Frank Hope Jones as among the most important early contributors to this discipline. In addition to his horological achievements, Hipp also made significant contributions to telegraphy, developed a visual traffic signal, an electric loom, and an electric clavier. CONDITION:very good overall, nickel plating very good, dial with a few minor scratches, hour hand with minor bends, bezel with minor dent at left where it joins the column, bob and indicator good, trailer a poorly made replacement, base with minor dings and scratches, wooden components with fading, dome very good, mirror with minor crack at upper right, not running. Herbert Scott (1865 - 1943) was born in Bradford, Yorkshire, England. 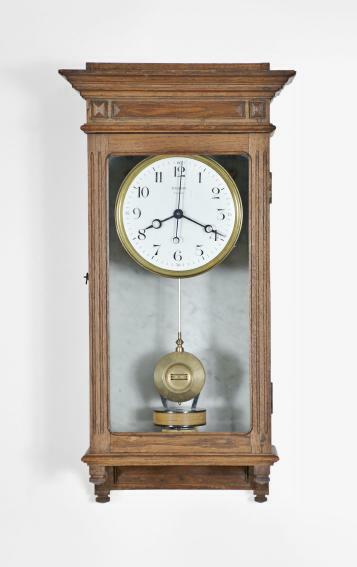 In 1902 he secured a patent for the mechanism used in this clock. A variation on Hipp's toggle, there are V notches at the tips of all escape wheel teeth, and a pivoted, L shaped trailer at the top of the pendulum rod. Following impulse, the trailer gathers the escape wheel teeth one at a time, thereby steadily advancing the hands. The pendulum amplitude eventually falls to a point where the trailer will no longer gather another tooth, and comes to rest in the V notch at a tooth tip. A projection on the trailer now is in line with the contact, and closes the circuit, thereby energizing the magnet, and providing impulse to the pendulum. CONDITION:very good overall, nickel plating very good, inside of columns with minor corrosion and verdigris, dial with a few minor scratches, hands with minor pitting, pendulum rod thread with scattered specks of oxide, bob and indicator good, base good, one label with significant losses, the other nearly intact, dome with small chip at bottom edge, not running. Herbert Scott (1865 - 1943) was born in Bradford, Yorkshire, England. 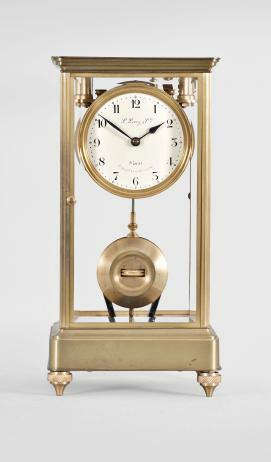 In 1902 he secured a patent for the mechanism used in this clock. A variation on Hipp's toggle, there are V notches at the tips of all escape wheel teeth, and a pivoted, L shaped trailer at the top of the pendulum rod. Following impulse, the trailer gathers the escape wheel teeth one at a time, thereby steadily advancing the hands. The pendulum amplitude eventually falls to a point where the trailer will no longer gather another tooth, and comes to rest in the V notch at a tooth tip. A projection on the trailer now is in line with the contact, and closes the circuit, thereby energizing the magnet, and providing impulse to the pendulum. CONDITION:case with minor scratches and dings, small, localized losses to finish, door glass with scratches, front plate of triangular movement polished, movement complete, pendulum rod with minor oxidation, bottom of threaded portion broken off, crutch linkage replaced, suspension broken, bob with minor oxidation, beat scale with minor scratches and tarnish, wood block with gouging at screw hole. See Robert H. A. Miles "Synchronome Masters of Electrical Timekeeping", pages 79 - 81 for a description of the movement, and explanatory diagram. CONDITION:case polished and lacquered, bell with tarnish, inside of case bottom with staining and corrosion from a leaking battery, plates with tarnish, some balance screws with added washers, hands painted black, balance contact lacking insulation at end, contacts dirty, lacking battery holder, not running. 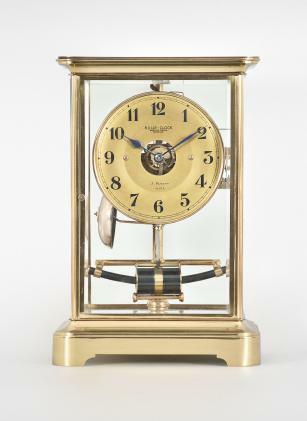 See Dr. Alan Shenton's "The Eureka Clock", page 95 for an illustration of this model as presented in the Eureka catalog. 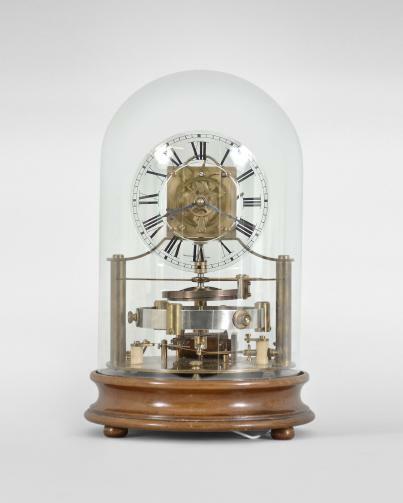 DESCRIPTION:Eureka Clock Co. Ltd., London, a rare, striking electromagnetic "1000 day" mantel clock, the rectangular oak base with conforming glass dome, supporting a Eureka "short" movement with spotted brass plates and large, vertical bimetallic balance, and electrically activated rack striking, roman numeral white enamel dial with open center, and blued steel spade hands, serial #196. 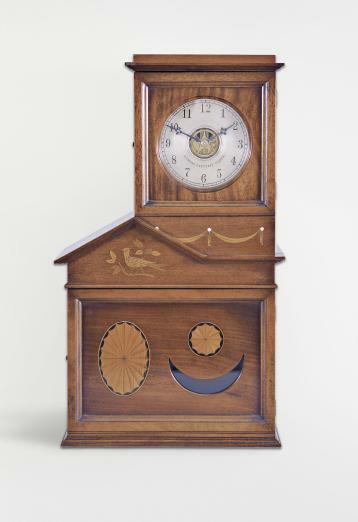 CONDITION:oak base and dome good, dial very good, hands with specks of oxide, movement in old lacquer and with tarnish, gong stand and gong with oxide, running, striking functional, but the gathering pallet is not advancing the rack fully to the next tooth. This clock, number 196, is discussed in Dr. Alan Shenton's book "The Eureka Clock", page 29, and is pictured on the following two pages. 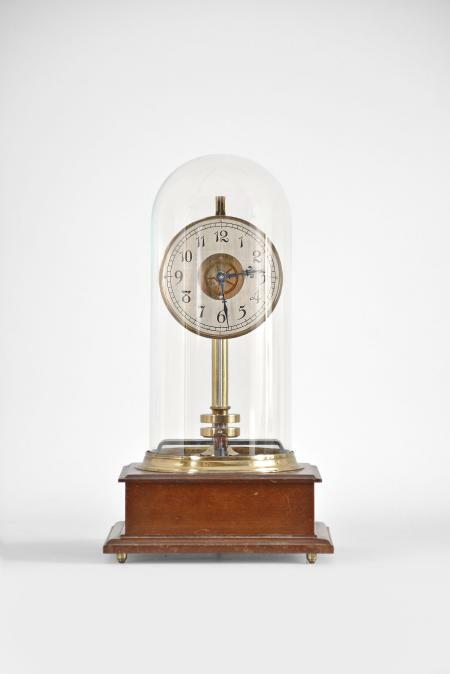 It was shown at the "Pendulum to Atom" exhibition in 1958, and again at the "Electrifying Time" exhibition in 1976/ 77. 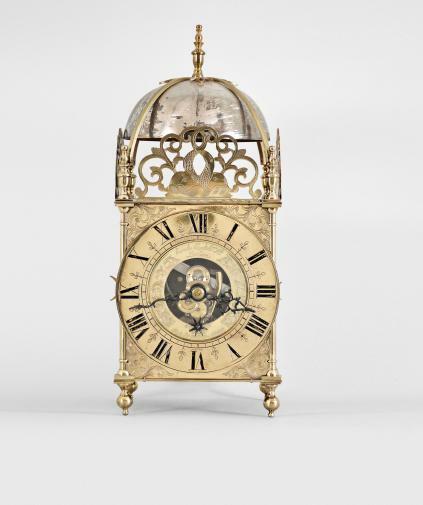 The clock was later sold at Christies, London, October 15, 1986, lot 133. 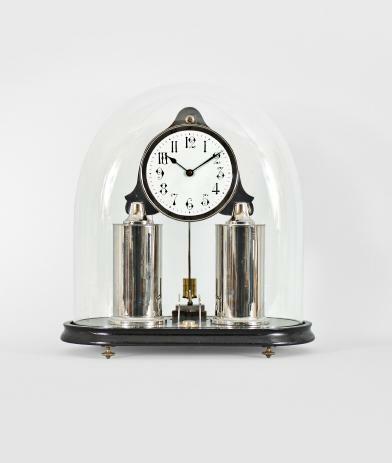 While patent papers showing a striking mechanism for use in Eureka clocks were filed by Lionel Asprey in 1913, no clocks are known to have been made to his specification. CONDITION:base originally with three feet, now missing, base dirty and with chips at front corners, lower plate with hole for unknown, missing component, gilding dirty, with spotting and minor losses, dial good, hands with minor patchy oxide, steel plate above armature coils with oxide, governor weights with tarnish, dome replaced, not running. 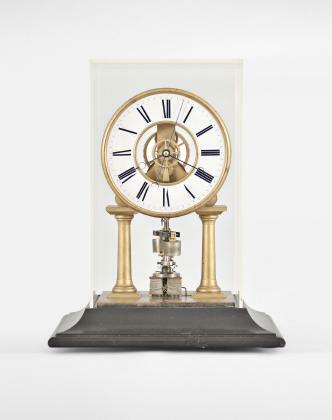 An unusual clock, using a motor with pinion at it's upper end, driving a contrate wheel at the bottom of the train, and providing continuous motion to the hands. The governor weights are thrown out with increasing speed, raising the governor frame, eventually breaking the circuit if the armature turns too rapidly. As the rotation slows, the circuit will be restored. 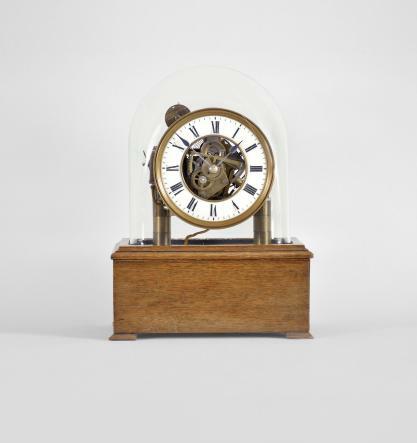 This clock was part of the Professor Iain Cleator collection, and was sold at Christies, London, November 25, 1998, lot 414.